Doctors take an oath to save lives but are taking their own at an alarming rate: That’s the focus of a new documentary and panel discussion that will take place at Des Moines University on Sept. 26 at 6:45 p.m. The events are being made possible by the Iowa Medical Society (IMS). 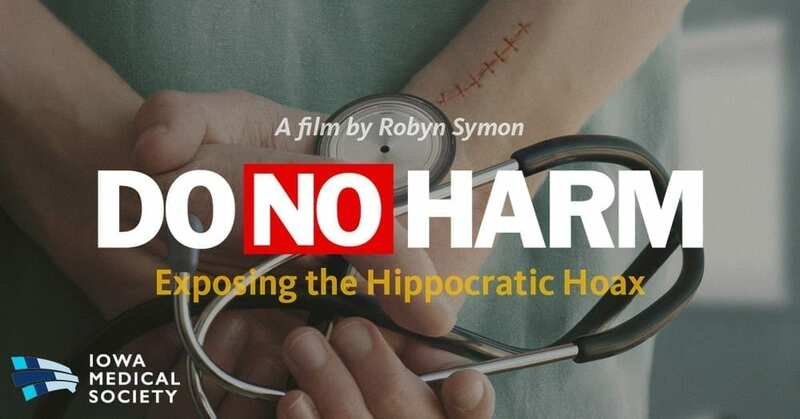 Produced and directed by filmmaker Robyn Symon, “Do No Harm” follows four people who represent the epidemic of depression, burnout and suicide among physicians and medical students. They include 2016 DMU graduate Hawkins Mecham, D.O., who attempted suicide as a student but was saved by a fortuitously timed phone call from his wife. Mecham will participate in a panel discussion after the documentary. In addition to the suffering and tragic loss caused by depression and suicide among health care providers, the epidemic creates great risk for patients. A study published in July by researchers at the Stanford University School of Medicine found that physician burnout is at least as responsible as unsafe medical workplace conditions for the estimated 100,000 to 200,000 deaths caused annually by medical errors. Individuals who are interested in attending the documentary and panel discussion are asked to register via the DMU website. Also on Sept. 26, from 5 to 6 p.m., the University will host a presentation by representatives of MYnd Analytics, a California-based company that has been conducting research nationwide to make the choice of medications for people suffering with mental illnesses easier and more reliable. The research team will present findings and implications of their groundbreaking studies. MYnd Analytics’ Psychiatric Electroencephalographic Evaluation Registry, or PEER Online®, consolidates data from more than 11,000 patients and over 40,000 outcomes. With their approach, patients with mental illness undergo an electroencephalogram (EEG) to measure their brain activity. The results are compared to those of individuals in the registry database who have similar brain patterns. That information can help health care providers determine the medication that is most likely to allow each patient to achieve a positive outcome more quickly. The “Do No Harm” showing and the MYnd Analytics presentation are available for continuing medical education. For information or to register, visit DMU’s CME website.